Save BHD 10.40 (52.26%) – Earn 9 Shukrans What is Shukran? Shukran is the Landmark Group’s award-winning loyalty programme in the Middle East, which allows you to earn Shukrans when you shop any of our brands. 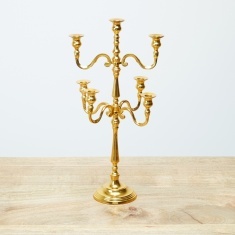 Make your home look elegant and rich adding this nine-armed candle holder to it. Featuring a hammered finish, this aluminium piece sports a classic styling and is shiny.